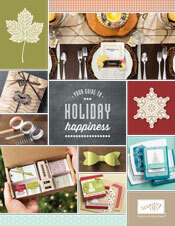 Stampsnsmiles: The Holiday Catalog is here! It's ready to view online and it's chock full of wonderfully creative ideas for the holidays along with, as always, beautiful new Stampin' Up! product. Flip through the new Holiday Catalog here! And remember, Holiday Product Shares begin shipping on Monday - see the flyer here! It's a way to purchase a sweet helping of Designer Series Paper, ribbon, embellishments, tags and bags without breaking the bank! And a card to enjoy while you're dreaming of new product! One of the swaps I received at the Stampin' Up! convention - this one from Carla Blake. I love the card and high-five to her for her inspirational year in Stampin' Up! Shop from the Holiday Catalog here! Ahh Penny, you're so sweet. Thank you!